For other uses, see Angelokastro (disambiguation). 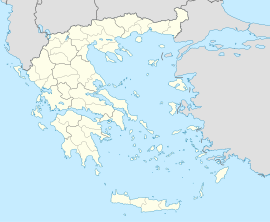 Angelokastro (Greek: Αγγελόκαστρο) is a village and a former municipality in Aetolia-Acarnania, West Greece, Greece. Since the 2011 local government reform it is part of the municipality Agrinio, of which it is a municipal unit. The municipal unit has an area of 55.726 km2.